GAINESVILLE, Ga. – CMS has developed the Solid Belt Flat Top Conveyor with a 40-inch wide belt. The Solid Belt Flat Top is a continuous one-piece belt with a center drive and tight transfer radius. It has 3 degrees of incline. 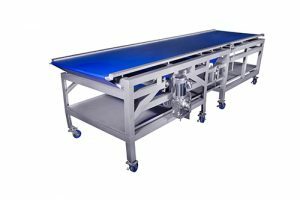 The conveyor is built on a solid angle frame and features a grove iron gearbox, high strength caster wheels and a 1-horsepower Sterling motor. It has sidewalls starting at the top of the belt, and it is offered in pneumatic, manual and static diverter options. The motor is placed relative to the customer’s needs.